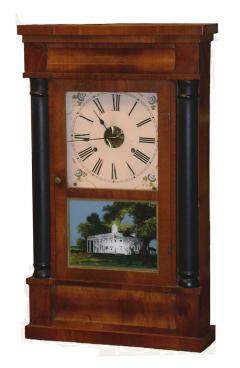 American Ogee clocks were common in the late 19th and early 20th centuries. They were a splendid combination of art and clockwork featuring a decorative veneer surrounding their perimeters. While of a bland rectangular shape, these clocks were relied upon for good timekeeping. Ogee clocks featured hand painted lead and zinc dial plates and twin glass door panes with the lower pane uniquely painted in a reverse fashion. The strike movement was weight-driven through a system of wooden pulleys, stranded brass cable, and steel arbors. New Haven was a well-known manufacturer of Ogee clocks. It’s only rare antique American Ogee clocks however, that will feature a company’s name within its case. The information usually appeared only on a paper label pasted in the case behind the pendulum bob. Excessive bushing wear will be indicated by up and down, side-to-side play of arbors.